Here we offer a fantastic 3 bedroom 2 bathroom townhouse in the centre of the market town of Turre. With lovely mountain views from the terraces, a private internal patio and a huge double garage, this property offers much more than your average townhouse. Turre provides many of your daily amenities, including shops, supermarkets, bars & restaurants, pharmacy, gym and a bustling street market every Friday. On approach to the property there is ample parking to the front as well as the huge private garage which would easily accommodate 2 cars. The townhouse measures 186m² and is set over 3 floors. Entering the property from the roadside you will find a door to the left that leads to the garage whilst a set of stairs lead up to the main front door that opens into a hallway. To our right is the spacious fully fitted kitchen with private patio which would be ideal as BBQ area. Back to the hallway a door on the right opens into a spacious living/dining room with plenty of natural light. At the end of the hall is a shower room and finally a covered terrace with lovely views to the Cabrera mountains. This terrace could easily accommodate a table and chairs for al fresco dining. Upstairs there are 3 great-sized double bedrooms; one with fitted wardrobes. The master bedroom also boasts a Juliet balcony and air conditioning. The layout on this floor is completed with the family bathroom. 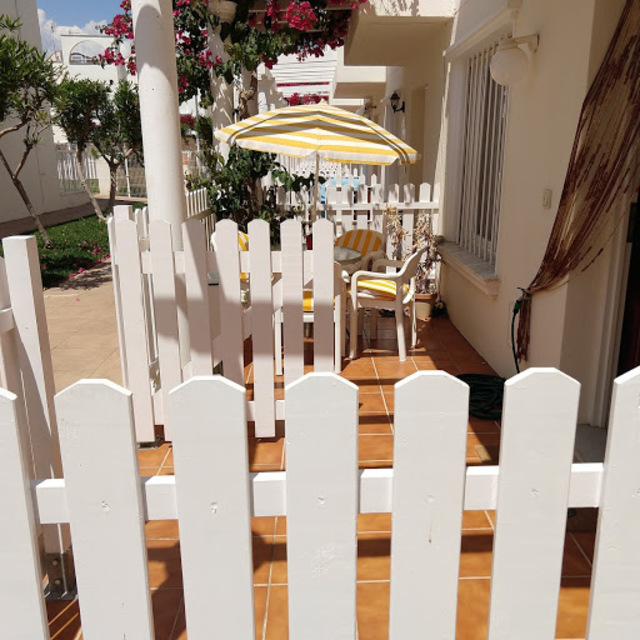 This property is ideal for either permanent living or as a lock up and leave due to its proximity to amenities and the beaches of Mojacar which are just a 10 minute drive away. Local airports include Almeria and Murcia San Javier at just 50 minutes and an hour and 30 mins away whilst Alicante airport can be reached within 2 hours. The owner of the property has indicated that it can be sold as seen, subject to negotiation.